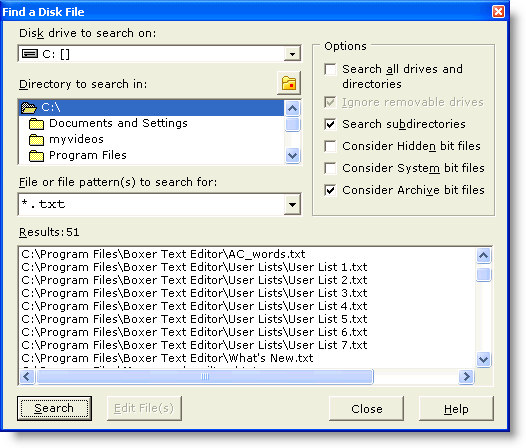 The Find a Disk File command provides the ability to locate one or more disk files which match a supplied filename or file pattern(s). Matching filenames are displayed in a results window, and one or more files from the list can then be selected for editing. The dialog box is non-modal and stay-on-top, so you can peruse the files opened and later return to the dialog to open other files, without losing the search results. This drop-down list allows you to specify the disk drive to be searched. When the Search all drives and directories checkbox is selected, this list is disabled. This drop-down list allows you to specify the directory to be searched. When the Search all drives and directories checkbox is selected, this list is disabled. Use the folder icon with the red square in it to jump to the directory of the current file. This edit box allows you to specify the filename and/or file pattern(s) to search for. A list of common file patterns has been supplied in the drop-down list, or you can type your own. When specifying multiple patterns, separate the patterns with a semi-colon and do not use intervening spaces. If this option is selected all drives and subdirectories will be searched, except that removable drives may be exempted using the option below. If this option is selected drives with removable media (such as floppy drives and mass storage cartridges) will not be searched. If this option is selected all subdirectories below the selected directory will also be searched. If this option is selected, files whose Hidden attribute bit is set will be considered during the file search. The Hidden attribute causes a file to become invisible to many directory listing programs, and is often used together with the System file attribute. If this option is selected, files whose System attribute bit is set will be considered during the file search. The System attribute is sometimes used by the operating system to distinguish files which should not be altered or deleted. If this option is selected, files whose Archive attribute bit is set will be considered during the file search. The Archive attribute is used by the operating system to flag those files which have been changed since the previous backup operation. Backup programs will typically reset a file's Archive bit after saving the file to a backup device. In most cases you will want to leave this checkbox active to ensure that recently changed files will be searched.